This blog has not always been kind to local Councillor Judith Blakeman, Leader of the Labour Opposition Group in Hornton Street, but we applaud the recent objections that she has made in response to the thuggish behaviour of the Planning Dept at Kensington and Chelsea Council. Well done to Councillor Blakeman for pointing all this out, but unfortunately too late for residents in her own Notting Barns Ward, whose views on the Kensington Academy (KALC) have been treated with contempt and disdain by those with power in the Planning Dept at the Council. The Planning Dept’s treatment of our community has caused great upset and will not be forgotten. The residents of Lancaster West Estate have been treated as poorly as the residents who faced the same callous Council indifference in the mid 70s, when the Westway flyover was first built, and they were forced to live, abandoned and betrayed, in the shadow of the motorway. At the KALC Planning Committee one Tory councillor did not even know the basic layout of the proposed site and repeatedly interrupted an objector who was raising legitimate objections – rude at best and intimidating at worst, particularly under such circumstances. 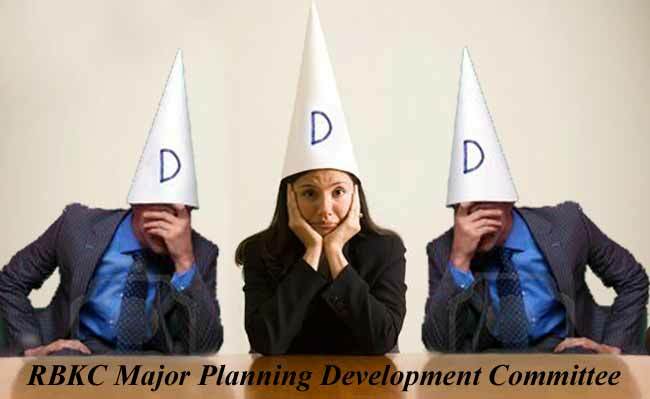 The actual KALC Planning Application was so flawed and full of misleading facts and claims that it was not fit for purpose and would never have survived even the briefest scrutiny from a competent Planning Committee which, of course, it never got. Needless to say the KALC application was a shoo-in! The issue of pollution in the vicinity of the Westway Sports Centre will come back to haunt the Planning Dept, and other members of the Council, who appear to have bullied a number of Majority Party Councillors into covering up this shameful ill-treatment of sports facility users, who are now forced to play football mere feet away from the slip road of a highly polluted and dangerous motorway. Councillor Professor Sir Anthony Coates (Conservative), who expressed his own concerns on this issue, was promised a report into pollution levels but seems to have been silenced and sidelined by an act of collusion between the Planning and Legal Departments. Our own Labour Councillors and local campaigners have to swim through treacle to make any progress on this issue, such is the determination in Hornton Street to bury this matter under the carpet. Councillor Coleridge’s (Conservative) platitudes to local campaigners do not impress, and the Council’s collusion in the poisoning of our community will eventually be exposed to the great shame and embarrassment of Coleridge and his ilk at the Rotten Borough.